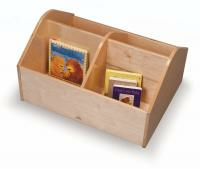 The Baby Book Chest offers book storage for first readers. Scaled down unit so books can be easily accessed and stored by little ones. 25" long x 20" wide x 14" high. 24 pounds. UPS or FEDEX Ground. GreenGuard certified. Made in USA. Dimensions: 20in. × 25in. × 14in.